Virtual New Zealand Stamps: 1978 Anniversaries. 10c - Stratford Centennial, New Plymouth. Stratford (Māori: Whakaahurangi) is the only town in Stratford District, and the seat of the Taranaki Region, in New Zealand's North Island. It lies beneath the eastern slopes of Mount Taranaki/Egmont, approximately halfway between New Plymouth and Hawera, near the geographic centre of the Taranaki Region. The town has a population of 5,610, making it the 47th largest urban area in New Zealand, and the fourth largest in Taranaki (behind New Plymouth, Hawera and Waitara). The Egmont Ring Plain provides steady contours and fertile volcanic soils which, together with the high level of rainfall, makes for some of the best dairy country in New Zealand. The district is predominantly dairying (57,300 dairy cattle), while the rolling to steep eastern hill country supports dry stock farming and forestry (42,000 beef cattle; 281,300 sheep). The energy and tourism industries are both of growing significance to the Stratford District. The Stratford Power Station is located 3 km east of the town. 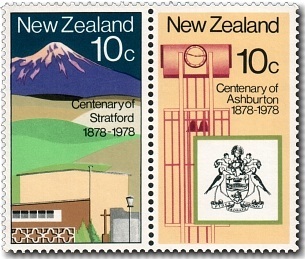 10c - Ashburton Centennial, South Canterbury. Ashburton (Māori: Hakatere) is a large town in the Canterbury Region, on the east coast of the South Island of New Zealand. The town is the seat of the Ashburton District, a territorial authority encompassing the town and the surrounding rural area, which is also known as Mid Canterbury. It is 85 kilometres (53 mi) south-west of Christchurch and is sometimes regarded as a satellite town of Christchurch. Ashburton lies in the middle of the fertile alluvial Canterbury Plains which permits agricultural activity such as dairying provided irrigation is used. In 2012, Ashburton was noted for having more cooperative companies operating in its district than in any other area of New Zealand, and was subsequently named by the New Zealand Cooperatives Association the "Cooperative Capital of New Zealand". Several of the 40-plus companies are national companies based outside the district, such as Fonterra, Foodstuffs and Silver Fern Farms (meat processing), but many were local cooperatives, such as the Ashburton Trading Society (farm supplies) and Electricity Ashburton (electricity distribution). 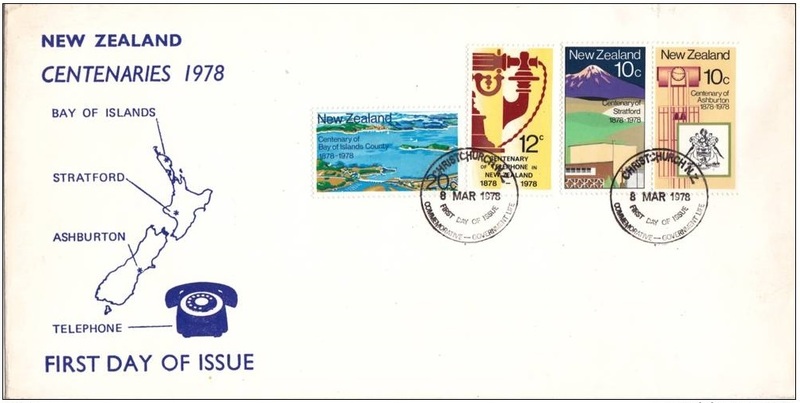 12c - Centenary of the Telephone in New Zealand. Telephones were first used in New Zealand as an ancillary to the telegraph service. The first exchanges were opened in 1881 at Christchurch and Auckland, Dunedin followed in 1882 and then Wellington in 1883. But it was in 1913 that the first automatic exchange equipment supplemented the manual exchanges. The first coin-in-slot telephones were tried in 1910 for local calls only and in 1938 multi-coin slot telephones were installed for local and toll calls. Today the telephone is a major communications system. 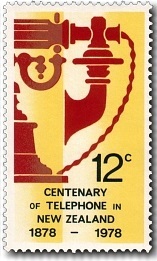 The stamp shows a red telephone from the 1880s against a yellow background making this a very distinctive stamp. 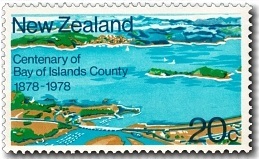 20c - Centennial of the Bay Of Islands. A drowned river system on the east coast of Northland between Whangarei and Whangaroa Harbours the Bay was visited by Kupe and Ngahue in the 10th century and Toi called there some 200 years later. In 1769 Captain Cook was the first European to arrive, but it was the arrival of Marsden in December 1814 and the founding of the first mission at Rangihoua which marked the beginning of permanent European settlement in New Zealand. In 1840 the Treaty of Waitangi was signed marking the beginning of New Zealand. 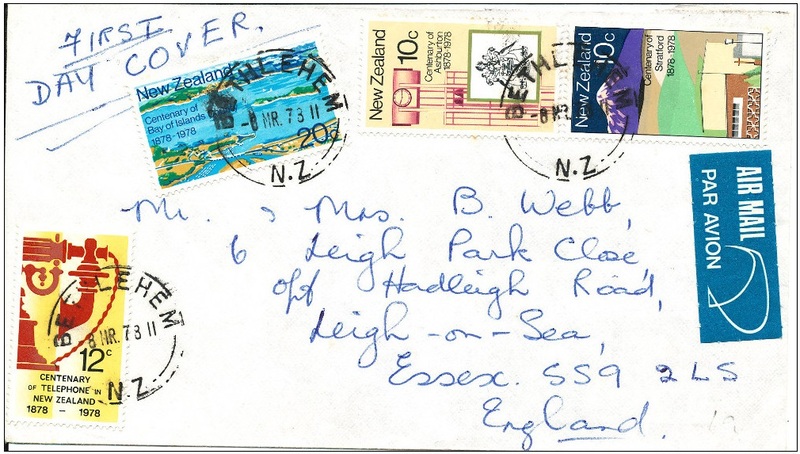 A First Day Cover of the 1978 Anniversaries, sent from Bethlehem near Tauranga to Essex, England. 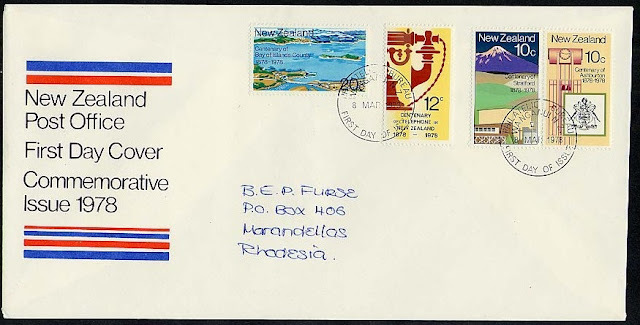 An official FDC sent to Rhodesia. 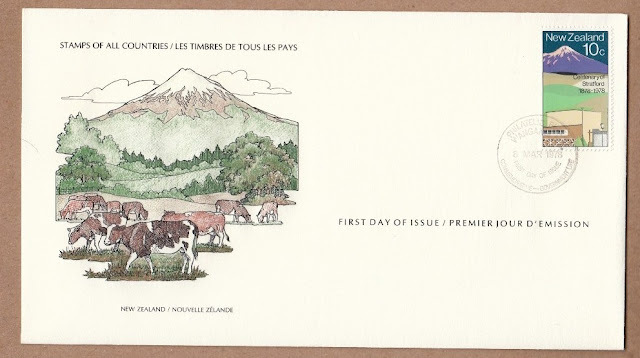 1978 International Society of Postmasters FDC.